Ray Lewis is a professional NFL player from Florida. Lewis is a two-time Defensive Player of the Year. Lewis played his entire 17-year career with the Baltimore Ravens. He was first-round picked by the Baltimore Ravens, and he led the team to a Super Bowl victory in 2000. As of 2019, Ray Lewis’ net worth is approximately $45 million dollars. Lewis considered one of the best linebackers in the history of football. Ray Lewis was born on the 15th of May, 1975, in Bartow, Florida. His early childhood wasn’t always stable. His mother Sunseria, was just 16 at the time of his birth and his father, Elbert Ray Jackson, was largely absent during his son’s childhood. As a boy, Lewis quickly became the man of the house. He helped his sisters with their hair and made sure his younger brother arrived at daycare on time. Lewis spent his entire 17-year career with the Ravens. He was a force and led the club in tackles his rookie season. In 2000 and 2003 Lewis received ‘Defensive Player of the Year’ which is just the sixth player in history to win the award multiple times. He earned 13 trips to the Pro Bowl throughout his career as a professional NFL player. In 2000, he led the Ravens to a Super Bowl title and took home the game’s MVP honors in the win. Lewis pursued to play at an astonishingly high level into his 30s. However, in 2012, his game had started to slow down. Shelved for a part of the year with injuries, he announced that he would be retired at the end of the season. The news rallied a Ravens team that had faltered at the end of the regular season and helped steer the franchise to big victories over Peyton Manning’s Denver Broncos and Tom Brady’s New England Patriots. Lewis played his final football game on February 3, 2013, in New Orleans, Louisiana; in Super Bowl XLVII, the Ravens went head to head against the San Francisco 49ers and won, 34 to 31. At age 37, Lewis had finalized his career with a second Super Bowl victory. As of 2019, Ray Lewis’ net worth is roughly $45 million dollars. View our larger collection of the best Ray Lewis quotes! Lewis launched his career at the University of Miami, a school renowned for the rigor of its football program. A confident, young Lewis told a reporter he was on track to become the greatest football player in its history. Seemingly brash comments from a player who had yet to see a snap in the NFL, it would be an immense feat given the wealth of illustrious careers born from that very university. Yet, Lewis did just that. Time is a commodity. Football is one of the most stringent and demanding challenges man encounters. A player’s career is generally limited to, and seldom sees past, double digits. Lewis has been in the league for seventeen years and is exiting on top. Your legacy is how you are remembered. It’s your story retold long after you are gone. Lewis considered one of the best linebackers in the history of football. There’s no doubt that he will remain as a legend. As of 2019, Ray Lewis’ net worth is estimated to be roughly $45 million dollars. 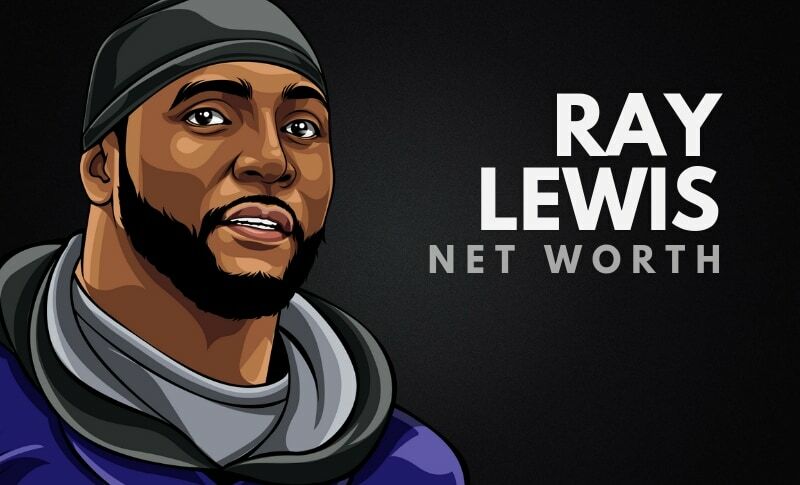 What do you think about Ray Lewis net worth? Leave a comment below.